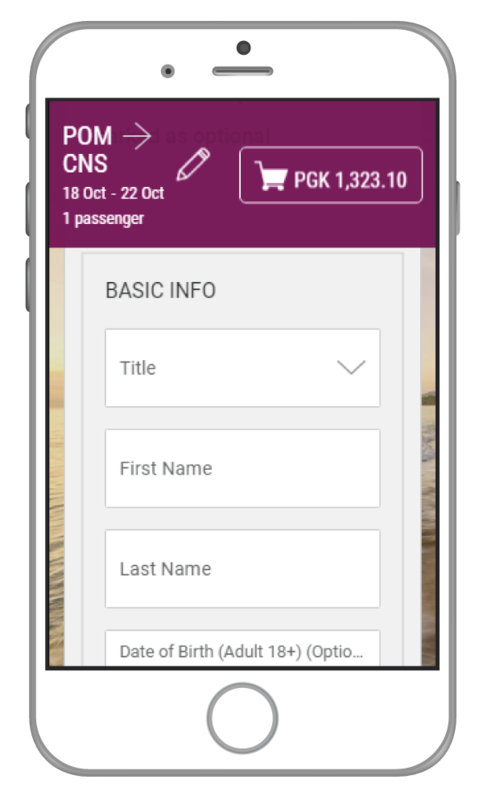 Experience our enhanced online booking system at www.airniugini.com.pg and let’s explore the newly adapted features which make our bookings system more efficient and convenient. Wouldn’t it be great if you could make bookings whilst you are out and about or on the go? You can now conveniently book your flights, check in online and access all online features from your smart phone or any mobile device. 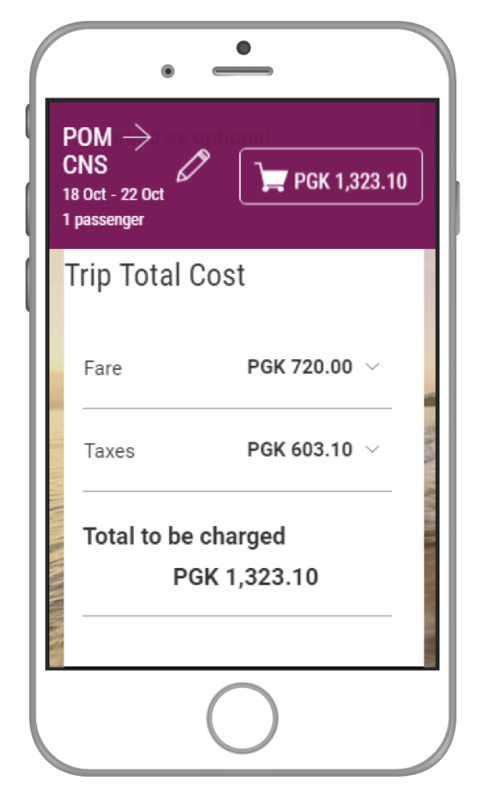 More convenient and a user-friendly booking experience with Air Niugini mobile bookings. You can easily go through our online booking system on a mobile device and it does not require you to zoom in order to read the content. Content you view through the mobile will be readable and fully functioning. Book online with us more conveniently using your of mobile devices. Looking to book your flights but worried about how a possible change in plans might affect your flight dates? 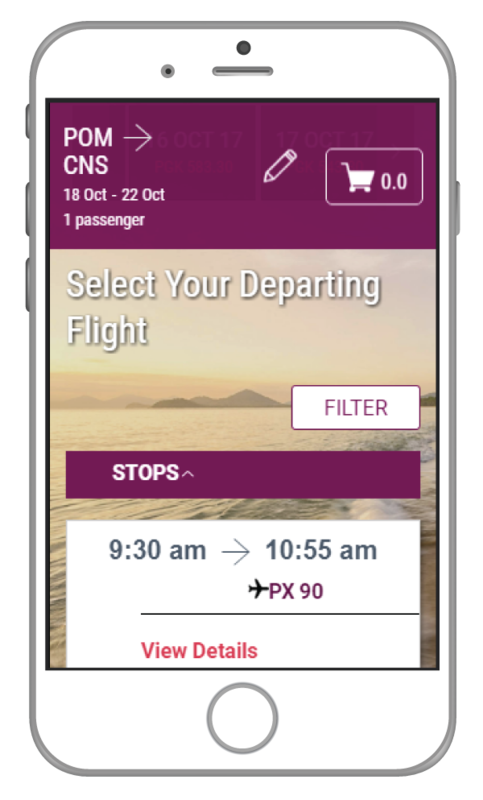 Air Niugini’s new online booking system allows you to see a variety of fares, compare the fare conditions and allow you to choose the best price and most convenient flight for your travel. Once you have entered the ‘Departing airport’, ‘Arriving airport’ and travel dates you will be directed to the search results page where you can compare the fare conditions. Click on your preferred price on each flight to see the other price options and their conditions. From this view you can compare and select your preferred fare for the flight. Here you can compare the baggage allowance, inflight entertainment, date change conditions, change fee, refundable ticket or not etc. You can select your preferred fare by clicking on ‘SELECT’ button. 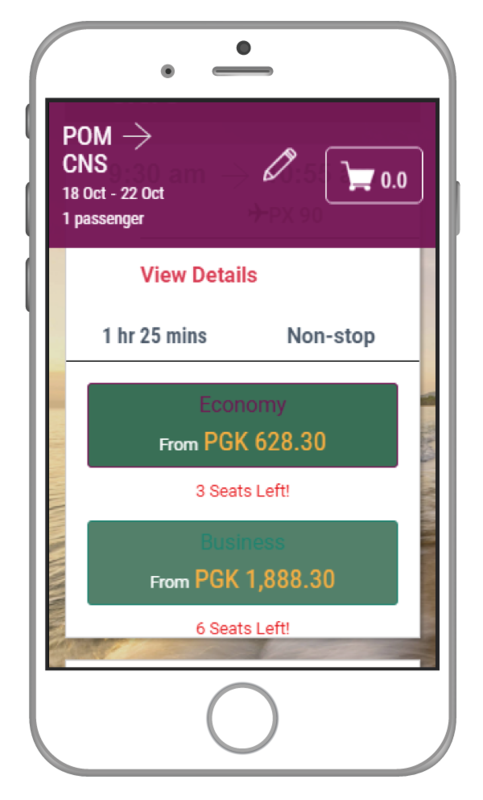 Now you can secure your preferred seat conveniently with Air Niugini online booking system while you book online. Our newly introduced ‘Seat Selection’ feature lets you reserve your preferred seat across our domestic and international flights. When you start making an online reservation, after filling the passenger information you will see the option ‘Continue to seat selection’. Once you click on that, you will be directed to the seat selection page. By clicking on the preferred seat you can save the seat for your flight. If you have another flight/ return flight on the same reservation, you will be offered to select the seat for the next flight as well. Click on “View Next Flight“ to view and select the seat. You can see the selected seat in purple colour as below. Once you have finished selecting the seats, you can complete the booking by selecting the payment method.